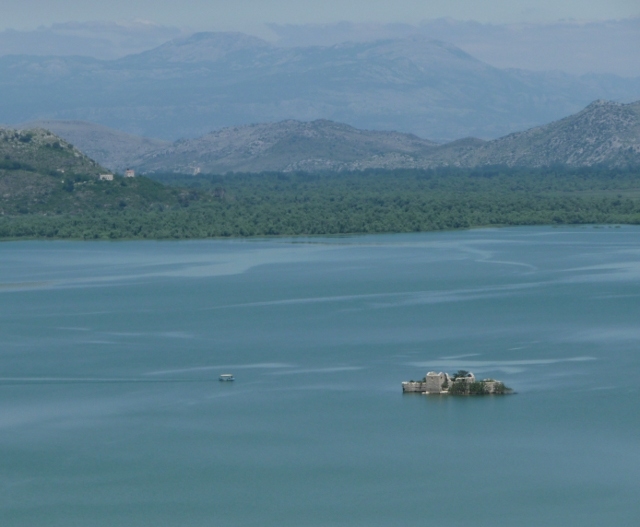 From Bar, we headed over the mountains inland, back towards Lake Shkodra – or Lake Skadar, as it’s known this side of the border. It’s only a narrow strip of land between the lake and the coast, but it feels like a different country in some ways. You leave behind the coastal resorts and development, and head in to utter wilderness. The road down the side of the lake is narrow and winds high above the water, with the cliff falling sheer down below. 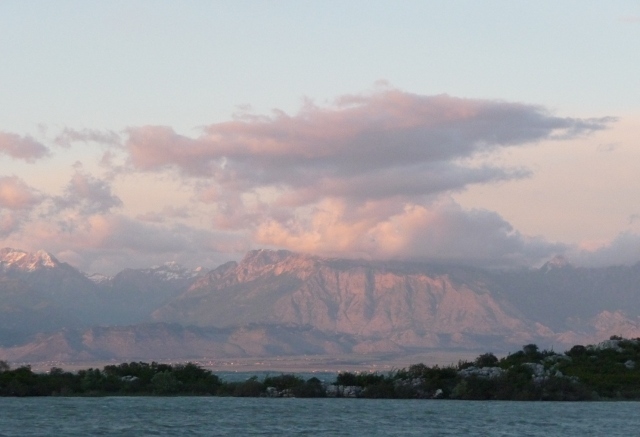 The views across the water to the snowy caps of the Albanian mountains are wonderful, too – taking in several islands with monasteries on, and one with a prison seemingly slightly larger than the island itself. All that, and it turned out we’d misunderstood the price, too – making it an expensive site, even without the dogs. Any plans we had to stay a second night were not long in evaporating. And so back over the mountains again. 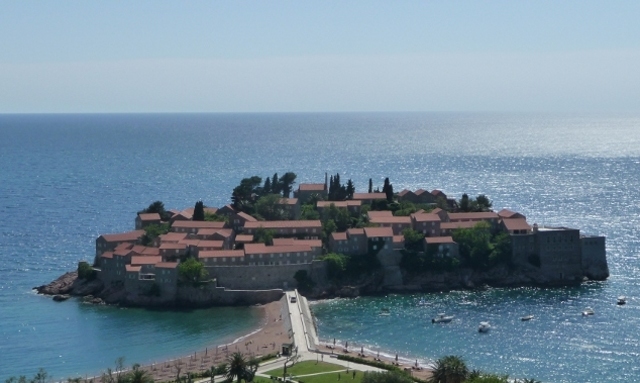 We had a quick look at one campsite, right next to the five-star resort island of Sveti Stefan (it must’ve been beautiful once, but was so heavily over-restored that it looked more like it was full of an estate of bland suburban executive homes). Quite possibly the best location we’ve seen for a site for months – an olive grove, rolling gently down the hillside towards the sea – but utterly wasted by the facilities. We’ve been in some ropy campsite loo blocks in our time, but these were positively comical. If ever there was a campsite which was crying out to be bought and upgraded, this is it. To add to our laughter, we asked the guy (clad only in a thread-bare towel below his stained tee-shirt) if there were laundry facilities available. Yes, there were – and at only €10 per load. 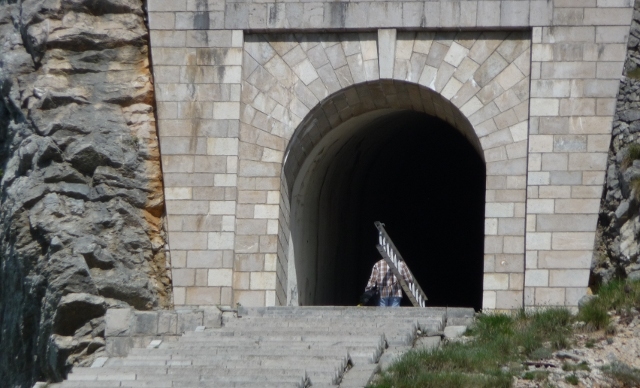 Finally, we reached Budva – Montenegro’s biggest coastal resort, and home to three campsites, one of which we’d been forewarned was Not Much Cop. Boy, was that correct! It felt more like some sort of pikey encampment than a holiday campsite, with barely a square inch free of dead and dying caravans that hadn’t moved for years. One of the other two was sort-of-closed, with apparent problems with water & toilets – but it was OK if we wanted to stay for one night. Umm, kind of you, but… Which left just one – the eponymous Camping Budva in the centre of town. Somewhere. Somewhere? Surely? Eventually, we found it. It wasn’t really very open, but staying wasn’t a problem. And so we headed in to town, since it was a Friday evening. The old town was really quite lovely, if a bit freshly polished – rebuilt after the same 1979 ‘quake that had hit Stari Bar so badly, of course. With massive superyachts lined up along one side, it certainly felt very upmarket, and many of the shops which lined every single street fitted that profile. But, somehow, it gelled for us. I think I must be getting old. We went back to the campsite. For much of the time it was capital, the country was ruled by “Prince-Bishops”, and the town’s also home to a pleasant little monastery, the church of which contains a relic claimed to be the right hand of John the Baptist. It’s also home to the national museum (or three). 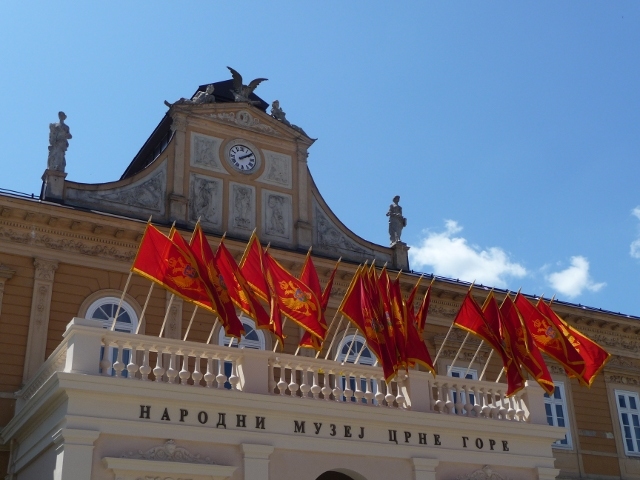 We had a wander round the art museum – a few icons, and a stack of 19th and 20th century works by artists from all over the former Yugoslavia, then a section of purely Montenegrin art. Most of it was quite nice, if not exactly world-class. Some of the modern Montenegrin artists, though – OK, it’s a small country, but I think some of ’em were there purely because of their passports rather than any artistic merit… But what do I know? We could ponder how the bleak distopic savagery of many of the works was a reflection on life in an area so recently war-ravaged, but my Brian Sewell impression isn’t really up to scratch. 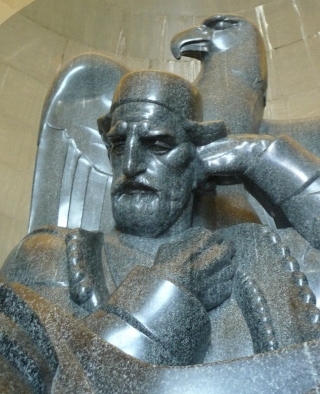 Montenegro’s big national hero is a mid-19th century Prince-Bishop, by the name of Petar II Petrović Njegoš. It sounds like he’s a fairly worthy recipient of this adulation, all 6’8″ of him. Not only was he a fairly enlightened ruler, but he was a very competent poet, best known for an epic called “The Mountain Wreath”. 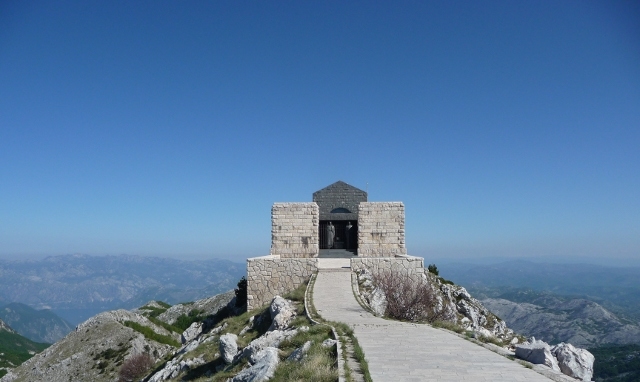 Njegoš is buried in a mausoleum, high on top of the tallest mountain peak in the Lovćen national park, just outside Cetinje. Which, of course, was our next port of call. Over the mountains yet again. After a night spent in the woods of the park, with wolves howling in the not-far-enough distance, we headed up to the mausoleum, arriving just in time to see the ticket chappy starting his walk up the 461 steps, with a ladder over his shoulder. 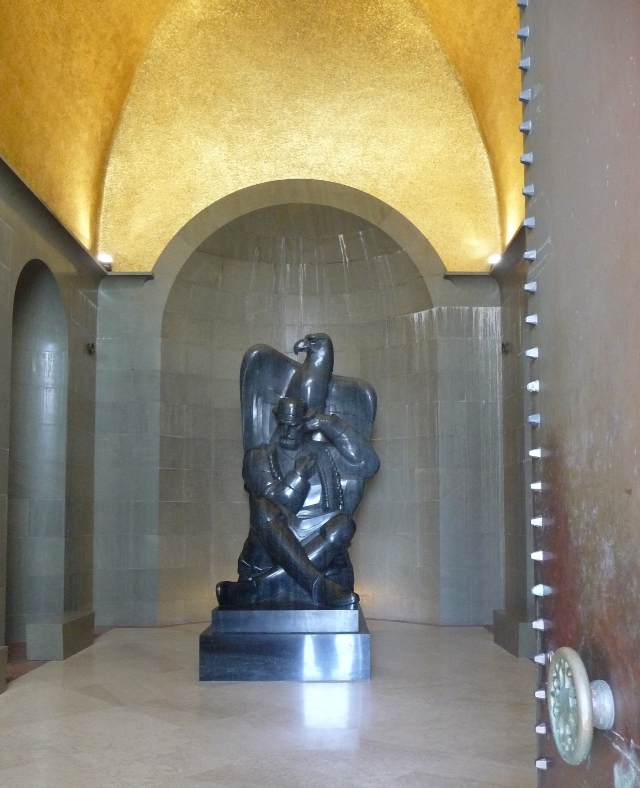 I’ll tell you something – when I die, I’d quite like to be laid in state in a mausoleum like that. Really quite impressive. He’s not had the most peaceful of rests – initially interred at the monastery for a few years, before he was finally moved up to the peak. There he sat until WW1, when the invading Austro-Hungarians shoved him back down to the monastery again to make way for something to mark their invasion. After they’d been sent packing, he was put back up there again, until WW2, when Italian bombs battered the little chapel. Back down again, this time until the current mausoleum was built in the early ’70s. Poor chap. Still, it was worth it in the end. 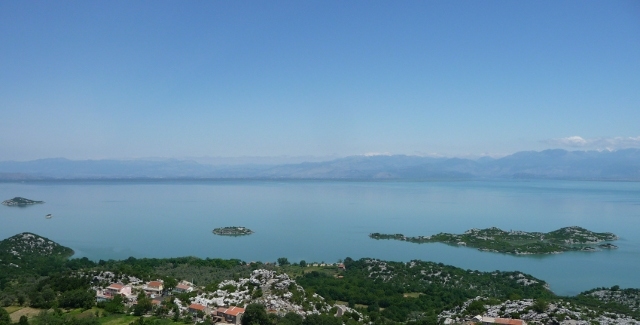 The Njegoš part of his name comes from the small village, way down below the mountain, where he was born – Njeguši. It’s other main claim to fame is as the last resting place of a substantial proportion of back legs of the country’s pigs. 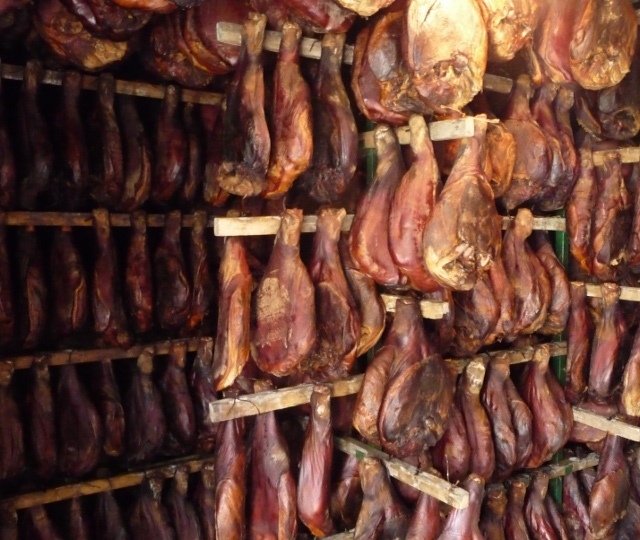 Njeguši pršut is a cured smoked ham, still artisanally made with the exception of one factory in the middle of the village. Even that’s not particularly large. As you enter the village, there’s little stalls lined up everywhere. For some bizarre reason, they’re mainly selling knitwear, but you can find the ham without too much difficulty. We asked at one knitwear stall, and were taken round to the back of the guy’s house – where he opened his shed door to reveal it as the smokery. The smell was utterly mouth-watering, and as he offered us a slice to taste, we had no difficulty in accepting. Washing it down with his home-made Rakija firewater was obligatory, of course. The village is also well known for a cheese, but it seemed that the ham was where their hearts truly lay – and, to be honest, the cheese we bought was very nice but nowhere near as special as the ham. Time, once again, to hit those mountains, and head over to the fjords. 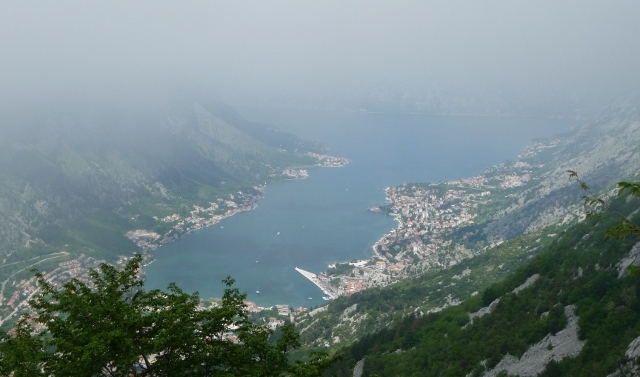 The bay of Kotor is, allegedly, Europe’s most southerly fjord. Quite what gives it that claim, I’m not sure – but as we wound over the tops with clear blue skies and started the descent, we were expecting some fanastic views. Unfortunately, we were met with a thick layer of cloud, climbing up the mountain towards us. 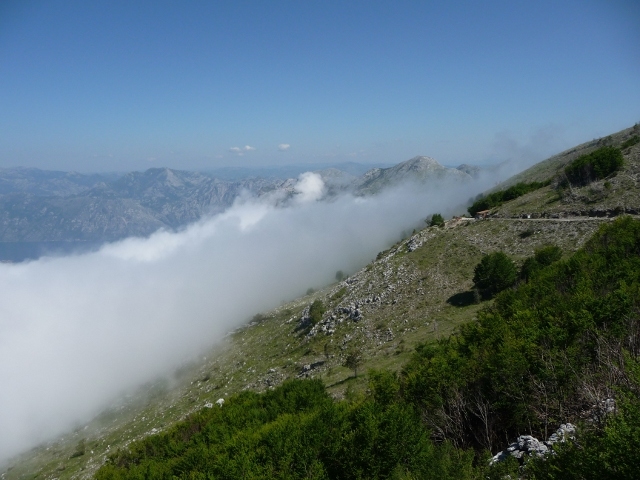 By the time we’d negotiated about ten of the thirty-odd hairpins, we were dropping out of the bottom of the cloud, and we finally started to get those views. This entry was posted in Art & Culture stuff, By Country - Montenegro, Food stuff, Travel stuff, Wildlife stuff. Bookmark the permalink.